SDXC, UHS-II SD Card 128GB designed for use with a wide range of manufacturers. Today's endless bit depth, high frame rates, and high resolutions - 4K and beyond - require storage solutions that are just as advanced. Memory cards need to be fast, high-capacity, widely compatible and, of course, extremely reliable. 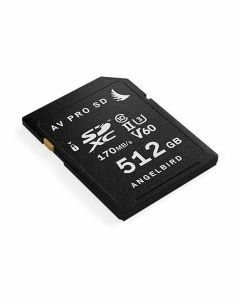 Angelbird's AV PRO SD V60 cards are built to meet those demanding criteria, not only for DSLR systems but also with drones, where extremes of temperature and humidity, as well as shock, are common challenges.